Sampadyam magazine, the most celebrated investments and financial planning magazine has been published its August 2014 issue. The major highlights of this issue include an interesting article on 'Five Shares which will double its market value', 44 page special on 'how to make money with Kudumbasree' and Rs 750 worth Demat Trading account. Readers can get the worth of reading the article on 'Budget and your pocket'. This issue also describes about the banks which could give maximum interest. People who are interested to schedule their home budget can use the current edition of the magazine to get updated about the trending thoughts. 'Five Shares which will double its market value' give an insight to the readers to know about the popular shares which would give back the maximum return. As investing in share markets have to be taken with much care, the article has its own importance in leading the readers to an extra mile. The Demat Trading account is needed by every shareholder for the purpose of transacting shares. After receiving an internet password and a transaction password, transfer or purchases of securities can be initiated once transactions are confirmed and completed. The female oriented Kudumbashree started by the offer a wide range of activities. An article featuring Kudumbashree opens new ways for the women community to make money doing inventive jobs. 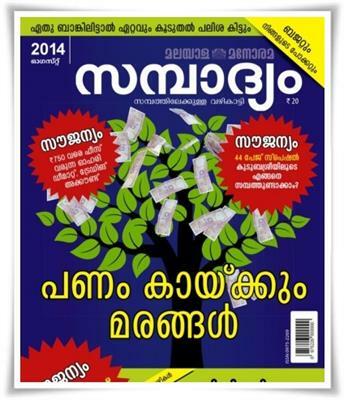 As a personal investment magazine, 'Sampadyam' also publish features on stocks, mutual funds, insurance and Income Tax. This magazine serves as an advisor and companion of people while taking decision on investment. A core team of dynamic youngster having a wide knowledge about money and investment bring innovative thoughts for the reading community. Articles on guidance on saving, investing, trick on managing money and achieving financial security have helped many people to take wise decisions before investing capital. Presented in a stylish and simple language, this magazine keep the readers get engaged till the last page. 'Sampadyam' is widely read by executives, entrepreneurs and high net worth investors who even recommend it to their friends and relatives for its thick packed motivating content.